The 2011 Northeast Regional education conference will be taking place April 29 through May 1 at the Seaview Resort in Galloway, N.J. This is the same location we have been to in years past and located right outside the heart of Atlantic City. We encourage you to save the date and be on the lookout for full details at the beginning of February! This is a great way to celebrate the end of tax season! New power tools help you deal with the latest estate planning tax rules! 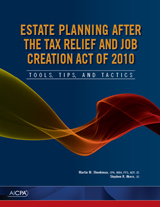 Member Martin M. Shenkman, CPA, MBA, PFS, AEP, JD and Steve R. Akers, JD recently co-authored Estate Planing After the Tax Relief and Job Creation Act of 2010: Tools, Tips and Tactics with foreward by Member Sidney Kess, CPA, JD. Finally - a product that answers all your objections to LTC insurance! “Traditional” Long Term Care insurance is not the right answer for some people and for multiple reasons, Linked Benefit/Combination programs may make a lot more sense.